When your flight arrive in Las Vegas you can quickly board your private car or shuttle with a driver who is familiar with the Sin City area. The Las Vegas McCarran International Airport is your gateway to this glittering city. Save your gambling for the casinos and make sure to book reservations for your airport ride in a stretched limousine or black car sedan or taxi from LAS airport before you leave for the trip. You’ll be glad you did when you can walk out like a celebrity and have your drive waiting to greet you and whisk you off to your hotel. You can also hire a rideshare service that will drive you to the Las Vegas Strip or the Las Vegas Convention Center for your trade show. Once you collect your bags after you land at LAS airport you can head to the ground transportation building to board your shuttle. In addition, free inter-terminal shuttles are available in each terminal. Groups who need Las Vegas hotel transportation including the major casinos are available from SuperShuttle, Showtime Tours as well as Airline Shuttle Corporation. In all their various ways to travel between the Las Vegas airport and other areas in Nevada. For a no frills ride to your destination at Caesar's Palace or the Luxor Las Vegas, SuperShuttle Blue Van is a perfect solution. Their shuttle service can’t be beat and if you’re in the mood for an upgrade you can try out their black car service by ExecuCar. GO Airport Shuttles Las Vegas airport transfer provider is Showtime Tours.They provide everything from airport shuttle service to private charters and sightseeing tours. They are your answer to getting around Vegas. LAS airport services the many casino hotels with shared ride van and private van service. Las Vegas McCarran International Airport has millions of travelers who arrive and depart its gates throughout each year. Most travelers are either seeking a quick shuttle ride or more of a luxurious private limo to nearby hotels or the major attractions that Las Vegas has to offer. Shuttle providers can be found curbside for limos and sedan rides. All rental car service is consolidated in a single facility three miles from the airport. 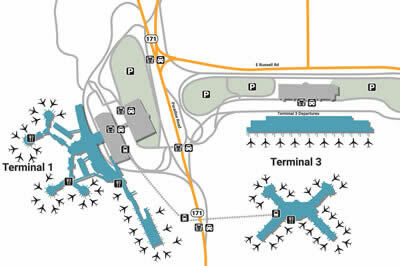 At LAS airport there is ground transportation pickup areas located at Terminal 1 and 3. Once you land and have picked up any baggage you are traveling with simply go to Level 1 of your Terminal's parking garage to meet your shuttle. Shared ride van service is very popular among passengers as LAS who are going to their hotel on the Las Vegas Strip. Passengers traveling in groups can find it easier to charter a van and ride non-stop to their destination in Henderson or Boulder City. Las Vegas Limousines, Omni Limo and Bell Trans provide some of Las Vegas’ most popular private sedan services. Many business travelers prefer to hire a private car to get from the airport to locations such as the Mandalay Bay Convention Center, Las Vegas Convention Center or the Sands Expo Center. Some people prefer a private SUV service. You can book your SUV reservation with ODS Chauffeured Transportation or Bell Trans. Once you arrive at the Las Vegas airport you can catch a cab to nearby Las Vegas Neighborhoods such as Spring Valley or Paradise. Nothing says Las Vegas quite like a ride in a stretched limousine from LAS airport. You can book yours with Las Vegas Limousines or ODS Chauffeured Transportation. If you are going to Las Vegas with a large group you can charter a bus to bring you to the MGM Grand or the Bellagio hotel. When getting picked up at LAS airport you can discover the various shops, amenities and the ground transportation locations outside the terminals. The LAS airport offers shuttle rides for passengers to local casino hotels and resorts such as the Luxor Hotel & Casino and The Venetian Hotel. Airport transfers can include shared ride van services, which are a popular choice, or private sedan and stretched limousine which are a more luxurious ride to travel by. Getting arriving and departing passengers transportation at the airport is an important part of most travelers trip that sometimes gets missed. That is why pre-booking your airport ride from our wide range of shuttle; sedan and taxi services can make your trip easier. You can choose from many excellent ground transportation providers as well. Las Vegas Limos as well as Bell Trans provide limousine service from the airport to the downtown Las Vegas districts. RTC Paratransit Shuttle provides bus service to the majority of casinos, hotels and local businesses including University of Nevada Las Vegas. All rental car service is consolidated in a single facility three miles from the airport. Wait times for your shuttle to your car is about ten minutes. All of the nationally known rental car companies and two locally owned operations service the airport. There are several convention centers in Las Vegas such as Mandalay Bay Convention Center, Las Vegas Convention Center and Sands Expo which are all located near many famous hotels and casinos where you can find quick and convenient rides. Most people come to Las Vegas for the gambling and entertainment provided by the casinos and resorts. If you want a room in a hotel that offers gambling, top name entertainment, luxury dining and all the perks consider a location on the strip like The Bellagio, Harrah’s, Caesars Palace which as convenient and cheap rates for shuttle rides such as shared ride shuttles and luxurious sedans. The Flamingo, the Mirage and Planet Hollywood all include other variety of airport transportation from limos to town cars and more. Most airlines and upscale hotels offer package deals on flights, accommodations and entertainment that can save you a few bucks to gamble with. There are a host of three and four star hotels and motels off the “Magic Mile” that have great shuttle transfer rates at a lower price. If you are looking to travel through downtown and the many casinos it has to offer then you can find the assistance you need with the local visitors bureau. If you came to gamble in Vegas, you can start with more than a thousand slot machines that are available throughout the airport. World-renowned artists decorate each concourse with paintings, sculpture and other art. The airport features a complete shopping center offering clothing, jewelry and a spa. There are a huge variety of restaurants available offering everything from fast food to Wolfgang Puck. There is an airport themed amusement area for kids and an aviation museum. Las Vegas is sometimes referred to as Hawaii’s Ninth Island because so many residents of Hawaii come visit the Las Vegas area each week. McCarran International Airport does both international and domestic flights and services cargo and private planes that come into the airport each day. As fitting as it may seem Las Vegas airport has over a thousand slot machines inside its terminals which passengers can play while they are waiting for their flights. Las Vegas also known as The Entertainment Capital of the World has many famous casinos and resorts in Las Vegas Boulevard or the Las Vegas Strip. If you are headed towards the downtown Vegas area you can drop by the Fremont Street Experience and enjoy the local bars. Some of the most famous casinos and resorts in Las Vegas are the Golden Nugget, El Cortez, Binion’s Horseshoe Casino and the Fremont Casino. When arriving in Las Vegas you can find countless hotels, casinos and plenty of entertainment throughout the Las Vegas Strip. Plan your trip by reading up on some of Las Vegas’ luxury hotels and resorts.